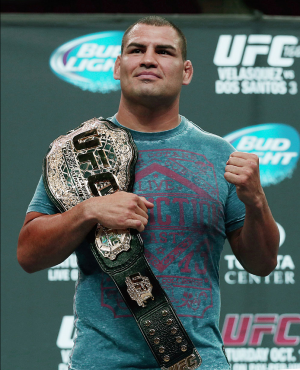 Cain Ramirez Velasquez was born on the 28th July 1982 in Salinas, California USA. His name precedes him as a mixed martial artist star. Having won the UFC Heavyweight Championship on two occasions has greatly influenced his fame and net worth. He has also been a sometime television star, as he enjoys stardom on Spanish language-speaking networks, and he is also in a music video “Te Siento” by Wisin & Yandel. Have you ever wondered how rich Cain Velasquez is? According to sources it is estimated that Cain Velasquez`s net worth is $900,000, which amount has been largely acquired through his fighting career in the Ultimate Fighting Championship, and also as the UFC Heavyweight Champion. Velasquez is of Mexican decent; his father, Efrain, was illegal emigrant from Mexico, until he married Isabel, allowing him to attain USA citizenship. Velasquez has two siblings, brother Efrain Jr. and sister, Adela. Ever since his high school days, which he spent at Kofa High school, wrestling has been his main occupation. While in high school, his wrestling score was 110-10 which also included winning the 5A Arizona Wrestling Championship twice . Following his graduation from high school, he enrolled Iowa Central Community College, and having wrestled for one year, he won NJCAA National Championship. Then he moved to Arizona State University, continuing with his wrestling, and in three years spent there, his results was 86-17. His college days weren`t just about fighting: he graduated with a Bachelors degree in Education. His professional career started shortly after college, when he joined the American Kickboxing Academy. His career in martial arts consisted of winning the blue belt championship in No-Ge Brazilian Jiu-Jitsu, and additionally he holds a brown belt under Dave Camarillo. Expanding his career to MMA, his debut was on 7 October 2006, winning that match against Jesse Fujarczyk by TKO in the first round. His debut in UFC was also a success; he defeated Brad Morris by TKO also in the first round. His career seems to have gone only upward since those wins, because he also won UFC Heavyweight Championship in a fight against Brock Lesnar, but he suffered an injury, namely he tore a rotator calf, and had to undergo surgery, which saw Velasquez sidelined for 6-8 months. The surgery went well and he returned to UFC, but he lost his title in a match against Junior Dos Santos. Nevertheless he regained the title against the same opponent on 29 December 2012. Injuries have marked his professional career, but he has still managed to win two UFC Heavyweight Championships. Regarding his personal life, he is dedicated to wrestling. He has a daughter, Coral Love born on 6th May 2009, with his wife Michelle; they have been married since May 28th 2011. Velasquez has a tattoo on his chest, representing the “Brown Pride”. Velasquez is also known for his cardiovascular training system. He has been a guest star on Spanish language speaking television networks like Telemundo and Univision, as he can speak both Spanish and English. He has also appeared on Lopez Tonight as a guest star.